Owl Always Be Reading: The 1 Year Blogoversary Celebration Continues with Another Giveaway! The 1 Year Blogoversary Celebration Continues with Another Giveaway! Hello Owls! Here is another great giveaway we are having for you all. 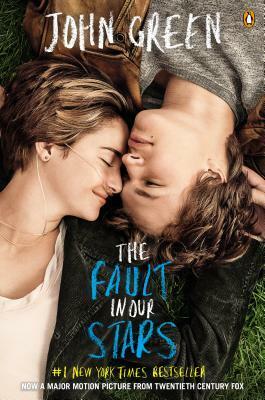 We are giving away a copy of The Fault in Our Stars (movie tie-in) because, well, we just love the book and can not wait to see the movie on June 6th! Also we are trying to get the stars of the film and John Green to come down to Florida, so if you wanna help out make sure to get all the info HERE! Sorry, international Owls, U.S. and Canada only. I remember reading half of it before when I was younger, and it just didn't hook me into the story. Probably because I was still young then, but after all of my friends were fangirling over the book, I want to give it another shot. I follow via GFC: Stephanie T.
The Fault in Our Stars is amazing. I cried so much at the end. haven't read it, but hope to, it's been on my to-read list! :) Thanks for the giveaway! I haven't read it yet :) I want to! It is on my to read list. I have read TFIOS. It is a great book and John Green is an incredible author. His books tend to be on the sad side, but are so well written that you feel like the characters are personal friends. I have recently been recomended this YA book. I haven't yet read "The Fault In Our Stars" simply because i am still discovering new books to read within this genre...having been a reader of just epic fantasy for so many years. It would be great to add a new book to my bookshelf! I have read it on my Kindle and loved it and I would love for my daughter to read it but she will only read print books! I have read it before, but its been a couple of years. I need to own the book so I can re-read & get ready for the movie. ;) I remember it being the only book that has ever made me cry. I loved it though. And I'm sure the movie is going to have people in tears. They need to have stands outside the theater with tissues on it, when the movie is over. Thank you so much for this giveaway. P.S. I follow thru Bloglovin (Misti). I read TFIOS about a year ago, and I still remember how sad I was while reading the end. It is definitely one of my favourite books of all time. Thanks for creating this awesome blog.I love everything u write. Tfios is one of my all time favourites. Thank you. I haven't read The Fault in Our Stars yet. I mainly haven't read it because of all the hype about it. I wasn't sure it would be good based on all the talk. Sometimes talk is just that talk and I didn't like Fifty Shades of Gray (and I HAVE read other books like it and love them). But as the talk on Tumblr and Goodreads kept popping up on my computer screen I have become intrigued and would love to read it before the movie comes out. I loved The Fault in Our Stars! Such a great book! I followed via GFC and Bloglovin(actually had followed there previously). I haven't read it, but I would like to! Haven't read this yet :( but I've been dying to and especially want to read it before the movie! I haven't read it yet because I'm in grad school and have too much required reading - I plan on reading it between semesters though because I have heard great things! I've read it & it was an awesome book. I'd love to have my own copy! I havnt read this I would like to though! I have read it, and I LOVE IT! John Green is so brilliant! <3 The romance, humor, and despair combine to create a perfect blend of perfect. I want the movie tie-in so badly.... The cover is adorable. I love this book, its so beautiful. I read the book in one day until 3am. I was hooked and couldn't put the book down. I cried so much at the end. I love this book and so excited for the movie. I am following you on Bloglovin, and Google + and twitter of course. I love this book! Cried so much!! Haven't read yet... just haven't thought about it. Haven't read this one yet. But can't wait to. Hello! If I read it and is one of the most beautiful books that have fallen into my hands. It has a plot that makes you laugh and mourn next page emotion or sadness. Few books have done that, but TFIOS succeeds handsomely. Thanks for the opportunity .. and I am following you on Bloglovin, and Google+ and Instagram and twitter of course. I bought it but haven't read it yet. My daughter (28) read it and RAVED about it. I may just make it my next read, even though I have about 8 new series releases and 2 arcs to read.